Ever since I was introduced to Green Smoothie Girl via Babies and Moms, Birth and Beyond podcast, I have been intrigued and interested in trying a green smoothie and getting into the habit of having these every day even. That was months ago though and regrettably I have not actually tried one until recently. My mom emailed me this recipe and I finally made one! The ingredients were pretty simple and things I pretty much always have on hand, except for the green part, the kale. I have never eaten kale before and really didn’t even know what it looked like except it was some type of green, leafy vegetable. My husband insisted that kale is only for garnish, GARNISH, and who would want to eat a garnish?? Needless to say, he was disturbed. In the end though, he is the one who purchased it for me as he graciously did the grocery shopping this week so I could take our daughter on a playdate to the park. He purchased a bag with the stems already taken off and the leaves torn up and washed, ready to go. The bag was $3 but a pretty good size. The recipe only called for a cup of the stuff, so I could get quite a bit of smoothies out of it if I wanted to. So the making of the smoothie was super easy, as easy as any smoothie recipe is. You just throw the ingredients in and blend away! With the first batch, I could see little green flakes and even had to chew a little. This did not in any way deter me, however. It was delicious! I didn’t even detect any kale flavor but definitely noticed the texture of it. So the next batch, I put on food processor mode and it blended that kale almost to oblivion. If you looked closely you could see teeny tiny bits of kale, but it was nice and smooth. My 14 month old loved the stuff, as did her mommy. She kept asking for more! I also had a friend over and did not tell her what was in it, just that it had a secret ingredient. :) She guessed it was a green of some sort, declared the smoothie delish and said if there had been some honey added, she wouldn’t have known there was greens in it at all! Kale has amazing health benefits, and when one single cup is added to a green salad, it provides almost twice the daily requirement of vitamin A, almost all of the vitamin C required for the day, and 1,300% of the daily requirement of vitamin K. That’s a lot of vitamins, but the health benefits don’t end there! Kale contains a number of compounds that most people have never heard of, and these compounds do a lot to keep the body strong, healthy, and free from damage. The health benefits are numerous. Eating regular servings of kale is a great way to help prevent and lower your risk of getting colon cancer, lung cancer, prostate, and breast cancer. In a nut shell, kale fights cancer, protects your vision, and boosts bone and heart health. Who wouldn’t want that, especially when it’s yummy! The first green smoothie was a success! I am so excited and can’t wait to make and share another with my baby girl tomorrow! This entry was posted on Thursday, May 27th, 2010 at 8:26 am	and tagged with green smoothie, greens, healthy living, kale, smoothie and posted in About Me, Food, Recipes. You can follow any responses to this entry through the RSS 2.0 feed. Glad you enjoyed the smoothie!! It’s such an easy and tasty way to sneak more veggies into the diets of otherwise anti-leafy-greens adults and kids. And if you use very ripe bananas, the natural sweetness completely masks any taste contributed by the kale. Congrats on your first green smoothie they are delicious. Green smoothies & freshly made vegetable/fruit juices are something I drink daily. You can definitely see (and feel the benefits.) I’m glad you enjoyed it. That’s great that you are incorporating healthy and delicious drinks into your daughter’s lifestyle, keep it up and it will be natural to her. :) My daughter won’t touch the empty calorie sugary drinks. She turned seven last Friday. Thanks for the encouragement! I love kale chips, too! It’s really good and you can’t even tell the kale is in there really! 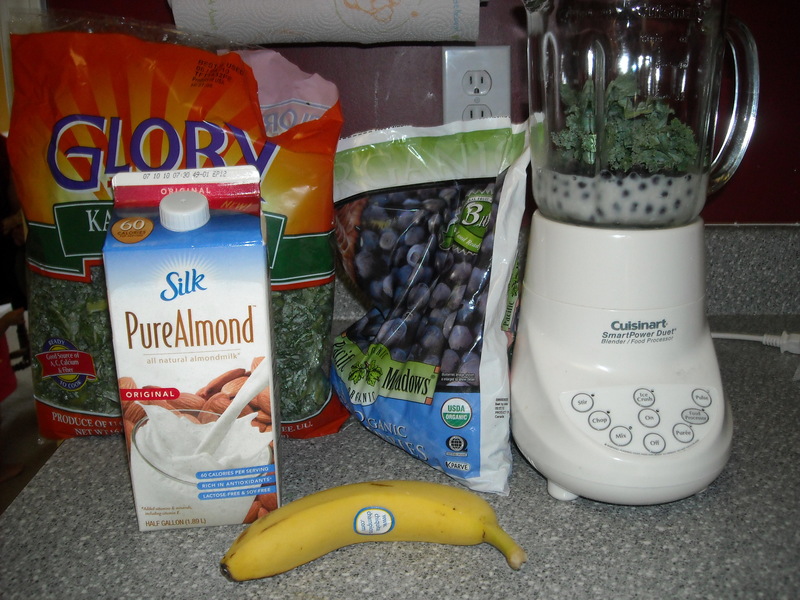 You really can’t taste the kale in this as long as it’s blended really well and the bananas are really ripe. :) I love it and have made several variations over time with the same base.